In the 1960s Dassault designed the Mirage F1 as a successor for the Mirage III family. Loss of energy in low-level manoeuvring flight of the delta-winged Mirage III led to development of a traditional layout for the wing. Evolved in parallel with the Mirage F2 as a scale-down, multi-role single-seat fighter employing a SNECMA Atar turbojet, the Mirage F1 was the subject of a government contract awarded in 1964. Possessing a conventional sweptback wing equipped with high-lift devices, and conventional swept tail surfaces, the private venture prototype F1 flew on 23 December 1966. On 23 December 1966 the first prototype made its maiden flight. Three pre-series aircraft were ordered in September 1967, the first of these flying on 20 March 1969. The initial production model for France's Armee de l'Air was designated F1C, placed emphasis on the intercept mission, was powered by an Atar 9K-50 turbojet affording 7200kg with afterburning, and had an armament of two 30mm cannon, two Matra 550 Magic and two Matra R 530 or Super 530 AAMs. An initial order for the F1C for the Armee de l'Air was placed in 1969, 162 being procured by that service (plus 64 recce F1CRs and 20 two-seat F1B trainers), initial operational capability being achieved in 1974. Many of the Armee de l'Air aircraft were delivered in, or retroactively modified to, F1C-200 standard with an 8cm fuselage plug to accommodate a removable flight refuelling probe. The Mirage F.1C entered service with France's air defence command (CAF-DA) in 1973, equipped with Thomson-CSF Cyrano IV all-sector fire-control radar. This type has also met with considerable success on the export market, customers including Ecuador, Greece, Iraq, Jordan, Kuwait, Libya, Morocco. South Africa and Spain. Production of 81 of this variant was followed by 89 Mirage F.1C-200 fighters fitted with a fixed inflight-refuelling probe at the base of the windscreen. The F.1-CR-200 became operational in July 1983, and carries cameras and infrared sensors internally with additional sensors in an under-fuselage pod. Improved navigation systems, radar, and a flight refuelling probe fitted as standard. The Armée de l'Air (French Air Force) operated the F1C as its main interceptor fighter until the service entree of the Mirage 2000 in 1984. The first flight was made by the Dassault Mirage F.1B two-seat dual-role trainer/tactical aircraft on 26 May 1976. Twenty Mirage F.1B conversion trainers (based on the Mirage F.1C but lacking its internal cannon) have also been received. It proved attractive to overseas customers, initial orders being received from Ecuador, Iraq, Jordan, Kuwait, Libya, Morocco and Spain. Single-seat aircraft, including the F.1A with its slightly increased fuel tankage, have a notional maximum weapon-carrying capacity of 13,889 lb (6 300 kg), excluding the fitted cannon. This total is made up of 4,630 lb (2 100 kg) on the centreline; 220 lb (100 kg) of chaff/flare dispensers on the fuselage shoulder; 2,866 lb (1 300 kg) at the inner wing; 1,213 lb (550 kg) on the outer wing pylons, and 331 lb (150kg) on the wing-tip AAM positions. Maximum FIC/E internal fuel capacity is 946 Imp gal (4 300 1) or 7,568 lb (3 433 kg) of Jet A-1 /Avtur whilst three external tanks can hold a further 1,012 Imp gal (4 600 1) or 8,096 lb (3 672 kg). Fuel and weaponry must be traded-off between the confines of a 16,314 lb (7 400 kg) empty weight and 35,715 lb (16 200 kg) max take-off weight. French Air Force F.1-Cs were delivered as or converted to F.1-C-200s by the installation of detachable flight refuelling probe. The Mirage F1E was a dedicated strike and attack aircraft which incorperated upgraded systems, including radar. Dassault also designed a two-seat version of the F1E for training, designated F1D. A simplified version, lacking certain avionics such as the Cyrano radar, was produced for South Africa (F1AZ and F1CZ for the interceptor variant) and Libya for the clear-weather attack role with ranging radar as the Mirage F.1A, with Aida radar in a slimmer nose filled with much of the electronics previously located behind the cockpit, where more fuel could now be stored. Other additions were Doppler navigation, an inertial platform. and a laser rangefinder. Libya, together with Iraq, Jordan, Morocco, Qatar and Spain, also bought the multi-role Mirage F.1E. An export model, the Mirage F.1E, is based on the F.lC with upgraded Cyrano IVM radar offering terrain-avoidance, air-to-surface ranging, and look-down capability. The model also has an inertial platform, digital computer, and improved head-up display. The Mirage F.1E entered service in 1976, and offered multi-role capability, including anti-ship attack with the AM.39 Exocet missile. According to Dassault data the Mirage F1E’s LO-LO combat radius with one centreline Exocet, two Magics, two ECM pods and two 264 Imp gal (1 200 1) external tanks is 435 mls (700 km), including the missile’s range of 37-43 mls (60-70 km). This is achieved at a cruising speed of 400 kts (742 km/h), apart from the first 59 mls (95 km) of the homeward flight, which are flown at 550 kts (1 019 km/h). Radius can be increased to 559 mls (900 km) with one “buddy” refuelling. A larger, 484 Imp gal (2 200 lt), tank is also available, but can be fitted only singly on the centreline pylon and has hitherto been employed mainly for ferrying. With one large and two small tanks and a H1-LO-HI mission profile, the Mirage F.IE’s radius may be increased to 870 mls (1 400 km), but only if the Magics and ECM pods are left at home and the weapon load reduced to just two 250-kg (55l-lb) bombs. Production of the AM.39 Exocet armed Mirage F.1-EQ6 for the Iraqi Air FoU continued until late 1988. The French Air Force has received the last of its Mirage F.1-CR-200 reconnaissance fighters. The specialized reconnaissance model is the Mirage F.1CR (based on the Mirage F.1C-200 and with a secondary attack capability) and this replaced the 50 or so Mirage IIIR/RD aircraft which equiped the 33e Escadre at Strasbourg, the French air force's sole tactical reconnaissance unit. Selected in February 1979, two Mirage F.ICR prototypes were produced for test duties, the first making its maiden flight on 20 November 1981. These two machines being followed by 62 production examples. Mission-related equipment includes OMERA cameras carried internally together with an infra-red sensor, while additional electromagnetic or optical sensors can be housed in an external pod fitted beneath the aircraft's belly. Air-to-air missiles can also be carried for defensive purposes, while inflight-refuelling gear is also fitted as standard. First flown on 22 December 1974, and built as an engine test bed under official contract, the Mirage F1.M53 was also envisaged as the basis for a contender in the contest to find a successor for the Lockheed F-104G in service with Belgium, Denmark, the Netherlands and Norway. Evolved from the basic Atar 9K-50 turbojet-powered Mirage F1C, the Mirage F1.M53 - referred to for a brief period as the "F1E", the suffix letter signifying Exportation and the designation subsequently being reassigned - was powered by the SNECMA M53 turbofan rated at 5550kg dry and 8500kg with maximum afterburning. M53 installation involved significant fuselage structural redesign, and to provide suitability for ground attack and long-range interdiction tasks in addition to that of interception, provision was made for multi-role avionics. By comparison with the F1C, the F1.M53 had increased fuel capacity, enlarged engine air intakes and strengthened undercarriage. The nose profile was revised to provide for the introduction of a retractable flight refuelling probe. The installed armament remained two 30mm cannon and it was proposed to distribute up to 4000kg of ordnance between seven external stations. The other contenders for the multi-national fighter contract were the Saab 37 Viggen and the General Dynamics F-16. With choice of the F-16 as winner of the competition, plans to produce a second prototype F1.M53 for testing and integration of systems were discarded. Variants of the basic aircraft offered for export, in addition to the F1C, were the F1A with simplified avionics for operation under VFR conditions and the F1E multi-role air superiority/ground attack/reconnaissance version. Export customers were Ecuador (16 F1AJs), Greece (40 F1CGs), Iraq (113 F1EQs), Jordan (17 F1CJs and 17 F1EJs), Kuwait (27 F1CKS), Libya (16 F1ADs and 16 F1EDs), Morocco (30 F1CHs and 20 F1EHs), Qatar (12 F1EDAs), South Africa (32 F1AZs and 16 F1CZs) and Spain (45 F1CEs and 22 F1EEs). Production of the Mirage F1 was completed in 1990 with 731 built (including F1B and F1D two-seat trainers and F1CR reconnaissance aircraft). In 1991, work began on the adaptation of 30 F1C-200S as F1CT ground attack fighters. 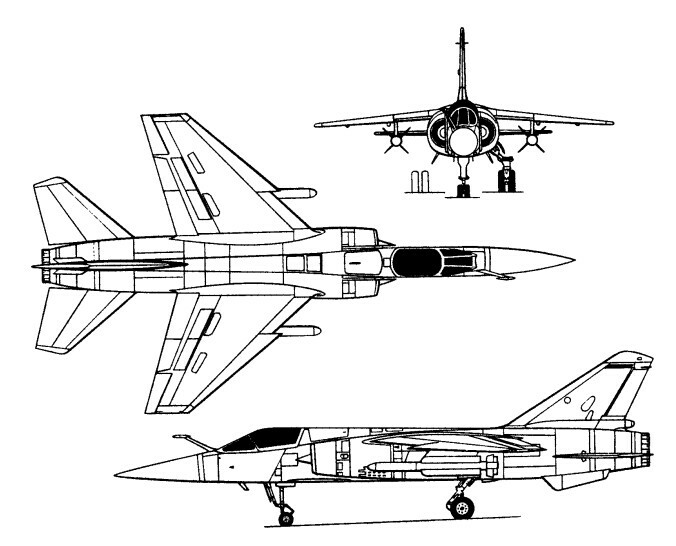 In the 1991 Gulf War, the Mirage F1 was operated on both sides. 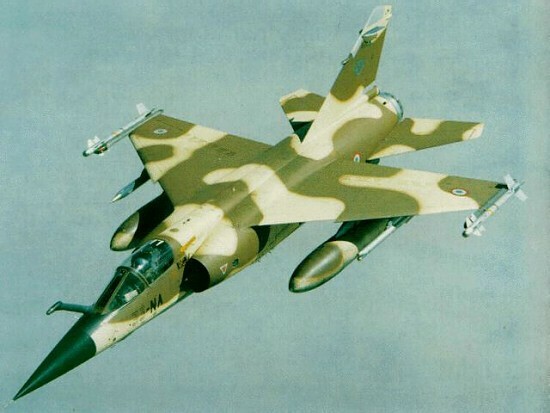 In the 1980s Dassault sold a large number of Mirage F1E and some F1B aircraft to Iraq (designated F1EQ and F1BQ respectively). When coalition forces struck numerous hardened aircraft shelters to neutralize the Iraqi Air Force in support of operation Desert Storm, many of these aircraft were destroyed. Taking part in the coalition was France, supporting air operations with F1CR and F1CT aircraft. Combat radius lo-lo-lo: 740 km. Powerplant: one SNECMA Atar 9K-50 turbojet rated at 7200-kg (15,873-lb) afterburning thrust. Engine: one 15,873-lb (7,200-kg) reheated thrust SNECMA Atar 9K-50 turbojet. Radius 265 miles (425 km) on a hi-lo-hi mission with a 7.716-lb (3,500-kg) warload. Wing area 25.00sq.m (269.1 sq ft).